Science and Metal music? Sure that works nicely, not only for the Higgs Boson sonification (youtube.com/watch?v=SXEnDM3hydM) - intelligence and the love for some rougher sounds do not exclude each other (even though e.g. Hollywood products try to convince us otherwise). 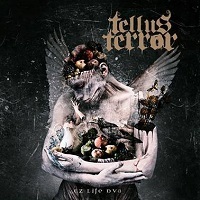 More proof is provided by the debut album of our Fresh Act Tellus Terror from Brazil, which deals with nothing less than the development of the universe, life as such and the fate of the human race. Too complicated? Not necessarily, when scientific facts are put into poetic lines like “Stardust we are”or (my favorite) “Rock and Metal are what mainly compose our home”. Although the guys emphasize their use of all kinds of genres, I put the main focus of this CD into the more extreme corner of Metal, where Thrash/Melodic Death/Black Metal elements meet. But not exclusively, as “Terraformer” rather leans towards Prog Metal, “Civil Carnage” kicks off in Punk/HC style, and “Brain Technology prt 1” offers heartbreakingly beautiful Epic Metal plus Opera-style female guest vocals by Larissa Frade. The last two tracks I would rather define as Power Metal, because of the groove that dominates “EndTime Panorama” … Brilliant musicianship, first-class production (mix and mastering by FredMan Studios, Sweden) plus fantastic artwork (Seth Siro Anton, Septic Flesh) – a great debut CD by this Brazilian band which I can highly recommend.